It looks like Windows 10 OS is stealing the show at the CES 2016 event. In the last two days, we’ve shared the details of 7 new laptops that were introduced at the event. Today was the day of Windows 10 tablets. Toshiba has unveiled its lightest and thinnest DynaPad tablet which runs on the latest OS from Microsoft Corporation. The 6.9 inches thin DynaPad weighs below 600 grams. It has a TruBrite full high definition 12 inches display. The screen is large because Toshiba has added a 2 in 1 functionality to its device, i.e. You can use it as a mid-range Windows laptop. This tab ships with anti-fingerprint layer along with Corning Gorilla Glass three protection. These two layers are an excellent addition to the DynaPad because Toshiba will sell this tab along with a Wacom Bamboo stylus pen. Like the DynaPad, the digital pen is a lightweight and modern input device. When the user writes on the display, the screen will not have fingerprints nor will it get scratches when the dust particles come in contact with it. The pen has its battery. On a single charge, it can be used for around 999 hours. BusinessWire reports that the Toshiba Dynapad will ship with an array of premium software. It will have the note-taking TruNote app along with screen recording and lecture recording software. Intel X series Z8300 processor and 4GB RAM will power this tab. Dynapad will boast dual array microphone system, 8 million pixel rear, and 2 megapixels front camera. It comes packed with 64 GB of internal flash storage memory and an HDMI micro port. Toshiba is selling this 2 in 1 Windows tab for under 40000 Rs (568 USD) on its official website. 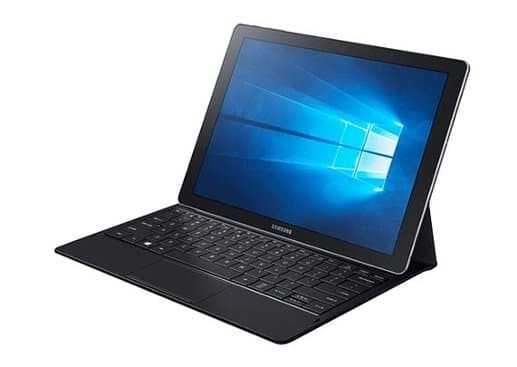 Another 12 inches laptop that was unleashed at the CES 2016 event is the Samsung Galaxy TabPro S.
Samsung’s latest Tab is a 2 in 1 device with 12 inches Super AMOLED WQHD display. It has Intel 6th generation dual-core Core M 2200 MHz processor and 4GB RAM. Galaxy Pro S has 39 watts 5300 mAh capacity battery. It will be available in the markets in 2 variants (with 128GB or 256GB solid-state drive). This Samsung tablet has LTE Cat 6 module, and it includes NFC chip. It has a fixed focus front, and rear AF enabled camera with an HD resolution supporting 5 million pixel sensor. The Galaxy S Pro’s battery offers 630 minutes of battery backup. It takes just 150 minutes to get completely charged. Unlike the Toshiba DynaPad, this tablet doesn’t have an HDMI connector. Samsung will sell a multi-port adapter for the Galaxy TabPro S, which will allow users to establish USB and HDMI connectivity. A Bluetooth pen will also be launched for the users looking for a separate input device. According to the official press release from Samsung, TabPro S will be officially launched in February. Price details have not been shared yet.